It’s here and we’re all excited about it! Chilly mornings and cooler weather has got everyone walking on air and looking forward to the seasonal changes ahead. The trees are feeling the excitement too and letting us know with hints of yellow and orange leaves. Fall is in the air and what could be more fall-like than putting on a warm cozy sweater and picking home-grown apples right off of the tree? 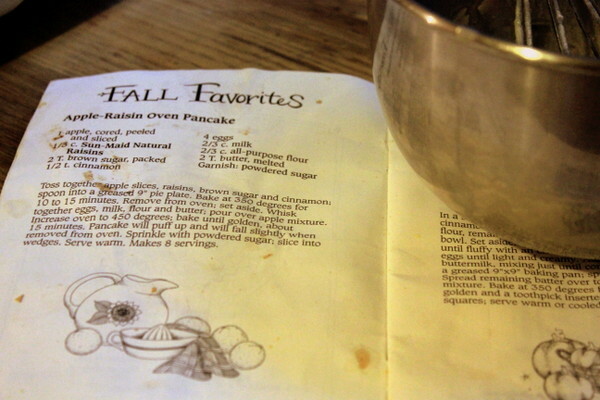 Baking a warm satisfying fall-favorite for breakfast is but one idea. 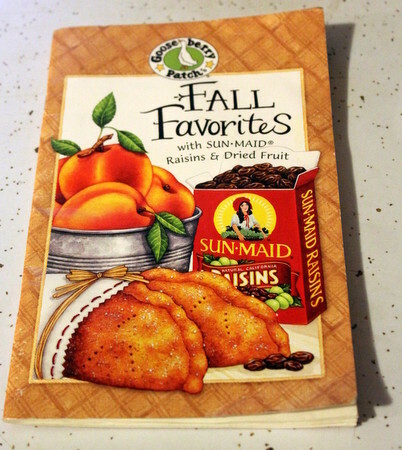 My Gooseberry Patch Fall Favorites Recipe Book is pulled out every autumn. It was a freebie from the people at Sun Maid and I am thankful for it. I turned to Apple-Raisin Oven Pancake. As the stains on the page attest, it’s a recipe that I use regularly. While the coffee brewed, I preheated the oven and prepared the ingredients. I recommend using 3 apples instead of 1 for more intense apple flavor. 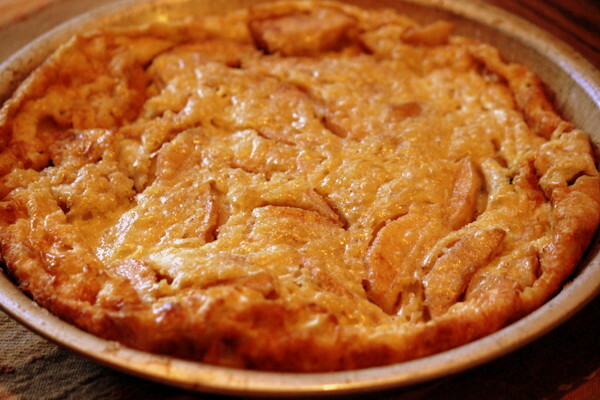 The house warmed as the sweet apple aroma of baking pancake filled the kitchen. After preparation and baking, about 40 minutes total, it was golden brown and ready to serve. This pancake taste good served as is or with a dusting of powdered sugar, but you might try a little light cream or real maple syrup for an extra touch. Try this recipe soon! Enjoy breakfast outdoors! Spread out a quilt and enjoy the crisp autumn air! 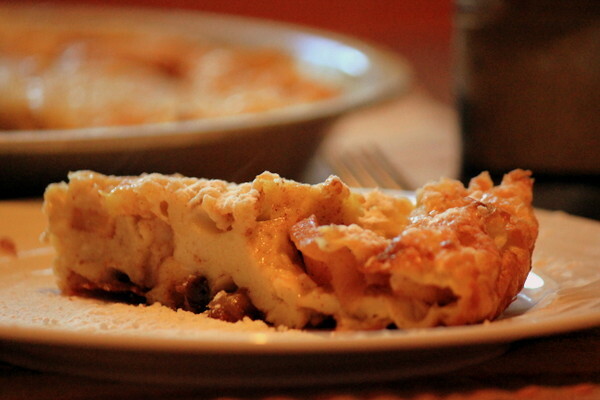 Toss together apple slices, raisins, brown sugar, and cinnamon; spoon into a greased 9″ pie plate. Bake at 350 degrees for 10 to 15 minutes. Remove from oven; set aside. Whisk together eggs, milk, flour and butter; pour over apple mixture. Increase oven to 450 degrees; bake until golden, about 15 minutes. Pancake will puff up and will fall slightly when removed from oven. Sprinkle with powered sugar; slice into wedges. Serve warm. Makes 8 servings. Breakfast, Recipes apples, Autumn, recipes, RMKK. permalink.